I don't know how they do it, but this stuff is good. Hot Bread Kitchen, based in Long Island City, bakes up some delicious granola. It's not too sweet, with crunchy almonds and pepitas, plump raisins, and just the right amount of flavor. I just had some with juicy peaches from the farmer's market and almond milk. A great way to start a rainy Sunday, or any day really. Hot Bread Kitchen also makes yummy crispy lavash breads topped with zaatar, sesame, or poppy seeds. They're great with cheese, hummus, or even naked. I haven't tried their focaccia breads or corn tortillas, but I'm guessing they're just as great as the granola and lavash. Of course, all of their ingredients are organic and local (or I wouldn't be telling you about them!). Where can I get these tasty baked goods? 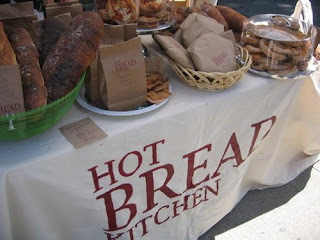 Hot Bread Kitchen, in keeping with the eat local philosophy, is [mostly] only available in NY. (Sorry to tease all of you outside NY!) You can find the purveyors of their goods on their site. Hot Bread Kitchen, in addition to being a great bakery, is helping to preserve the culinary traditions of different cultures from around the world. At the heart of their business is support for women who've immigrated to the US -- empowering them through jobs and providing ESL classes.